One Shot: This mode, geared to shooting stationary subjects, locks focus when you press and hold the shutter button halfway down. This setting is used for all scene modes except Sports. It’s also the default mode for the advanced exposure modes. One important point to remember about One Shot mode is that if the camera can’t achieve focus, it won’t let you take the picture, no matter how hard you press the shutter button. Also be aware that if you pair One Shot autofocusing with one of the Continuous Drive modes focus for all frames in a burst is based on the focus point used for the first shot. AI Servo: In this mode (the AI stands for artificial intelligence, if you care), the camera adjusts focus continually as needed from when you press the shutter button halfway to the time you take the picture. This mode is designed to make focusing on moving subjects easier, and it’s the one the camera uses when you shoot in the Sports scene mode. For AI Servo to work properly, you must reframe as needed to keep your subject under the active autofocus point or zone if you’re using the Single-point or either Zone AF Area modes. If the camera is set to 45-Point Automatic Selection, the camera bases focus initially on the center focus point, but you can select a different point if you like. If the subject moves away from the point, focus should still be okay as long as you keep the subject within the area covered by one of the other autofocus points. 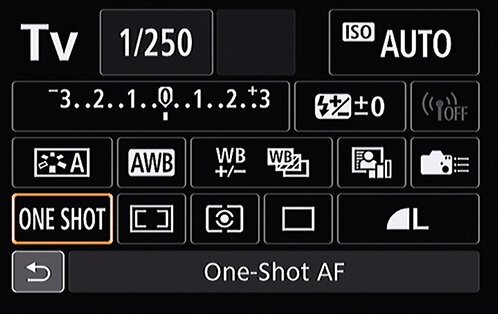 If you use this AF operation mode with the Continuous Drive mode, focus is adjusted as needed between frames, which may slow the maximum shots-per-second rate. However, it’s still the best option for shooting a moving subject. AI Focus: This mode automatically switches the camera from One Shot to AI Servo as needed. When you first press the shutter button halfway, focus is locked on the active autofocus point (or points), as in One Shot mode. But if the subject moves, the camera shifts into AI Servo mode and adjusts focus as it thinks is warranted. AI Focus is the setting used when you shoot in the Scene Intelligent Auto, Flash Off, and Creative Auto modes. You may not want to use AI Focus if you don’t want to rely on the camera to figure out whether you’re interested in a moving or stationary subject. If that’s the case, stick with One Shot for stationary subjects and AI Servo for focusing on moving subjects. One way to remember which mode is which: For still subjects, you need only one shot at setting focus. For moving subjects, think of a tennis or volleyball player serving the ball — so AI Servo for action shots. The current AF operation mode appears here. AF button: Your fastest move is to press this button (on top of the camera, just above the LCD panel). All data but the current setting disappears from the LCD panel; rotate the Main dial to change the setting. If the Shooting Settings screen is active, you see the screen shown on the right in the image above. Again, either rotate the Main dial to choose a setting or just tap its icon and tap the return icon. Quick Control screen: Select the AF operation mode icon. The selected AF operation mode setting appears at the bottom of the screen. Rotate the Main dial to cycle through the three mode options. You also can adjust the setting via the Quick Control screen. If you prefer, you can tap the icon or press Set to display the screen above, where all the mode choices appear.